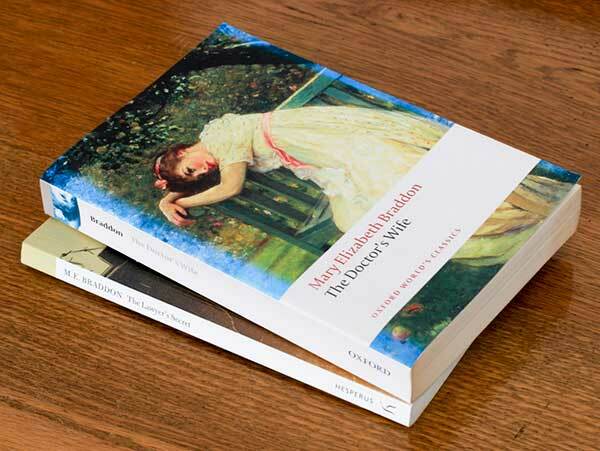 Most famous for Lady Audley’s Secret, Mary Braddon was in fact a prolific writer, often working on several pieces of writing simultaneously – magazine serialisations as well as books – much like her contemporary, Charles Dickens. 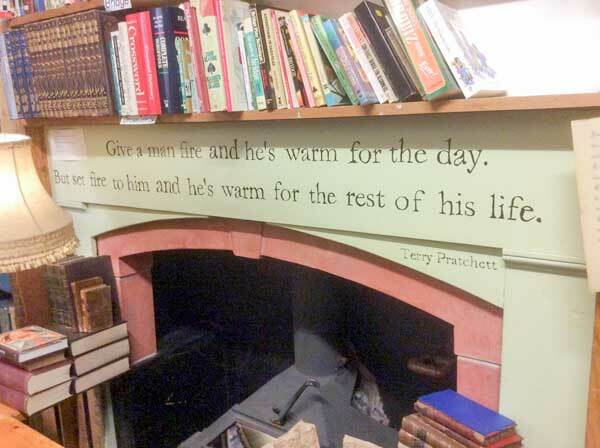 Her work was ‘perfectly attuned to the spirit of the years in which it flourished‘ but seems to have fallen into a vacuum these days – very few booksellers I’ve spoken to have even heard of her, and it’s taken me years to track down more of her books in real bookshops. 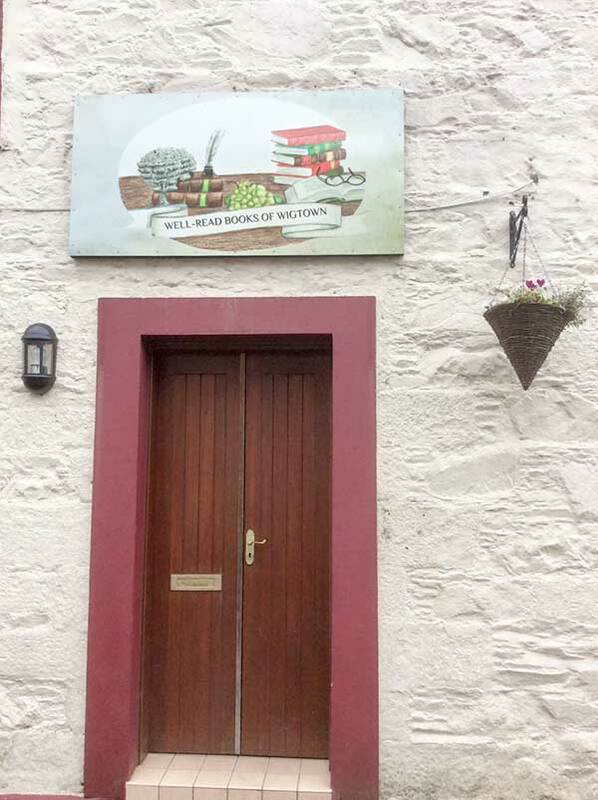 Then, just this month, I found two volumes in Wigtown in a newly opened bookshop, Well-Read Books, thanks to its knowledgeable owner, Ruth Anderson, QC. The one I want to tell you about today is a slim volume, a composite of two of Braddon’s novellas. 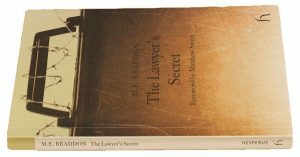 In brief, The Lawyer’s Secret tells of orphaned Ellinor Arden who is summonsed from Paris to London to hear her guardian read the will of her estranged uncle, Squire John Arden of Arden, a relation she never even met. She is amazed to learn that she’s named as his sole beneficiary … on one condition: she must marry his adopted son, Henry Dalton. Long ago John Arden had loved Henry’s mother, but she’d rejected him in favour of a younger humbler poorer man, a country surgeon. Henry was adopted by the Squire after the death of his parents, but brought up to stand on his own two feet, not to inherit the Arden fortune. Against his own finer feelings, Ellinor’s rather dashing guardian, lawyer Horace Margrave, urges her to comply with the stipulation, but we know from the outset he is in possession of some deep dark secret. Naive, romantic Ellinor is quickly disillusioned when her new husband denies her access to the money and curbs even her philanthropic intentions. She appeals to her ex-guardian, but he insists his role is finished now she has a husband to protect and advise her. Ellinor engineers her own escape back to Paris, and only discovers the truth when she is summonsed to the bedside of a dying man who refuses to divulge his name. 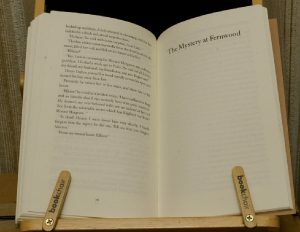 The second half of this little book is devoted to an even shorter novelette: The Mystery at Fernwood. After a brief six week acquaintance, Isabel Morley, orphan heiress of a wealthy Calcutta merchant, is engaged to be married to Mr Laurence Wendale, handsome, privileged, and vivacious son of ailing Mr Lewis Wendale, owner of the country mansion, Fernwood, ten miles from York. From page 2 we know that her life is heading for shipwreck; she tells us so herself. The ‘why’ creates the suspense. Fernwood is a rather dreary isolated sprawling place, offering precious little diversion for a lively 19-year old girl, but Isabel is intrigued to find an invalid relation, ‘Mr William’, has been cared for in a suite of rooms in the west wing of the house for over twenty years. Laurence tells her he has never ever met William, and indeed shows remarkably little curiosity about the man, but his half-sister, Lucy Wendale, has been a devoted visitor. On the death of the invalid Lewis Wendale, knowing precious little of the family history, Isabel prepares to take over as mistress of Fernwood, enthused by her fiancé’s energetic plans to bring the ancient building into the modern era. When she finds Laurence trapped in a locked room, she turns the key, and inadvertently releases the most blood-chilling events which change the lives of everyone completely. I confess I suspected what lay behind the mystery from early on, but the horror was still real and the detail still shocked. Braddon is indeed an accomplished writer, and I’m placing her books with great reverence amongst my collection of classics. I’ll tell you about her full length novel, The Doctor’s Wife, in a separate post. 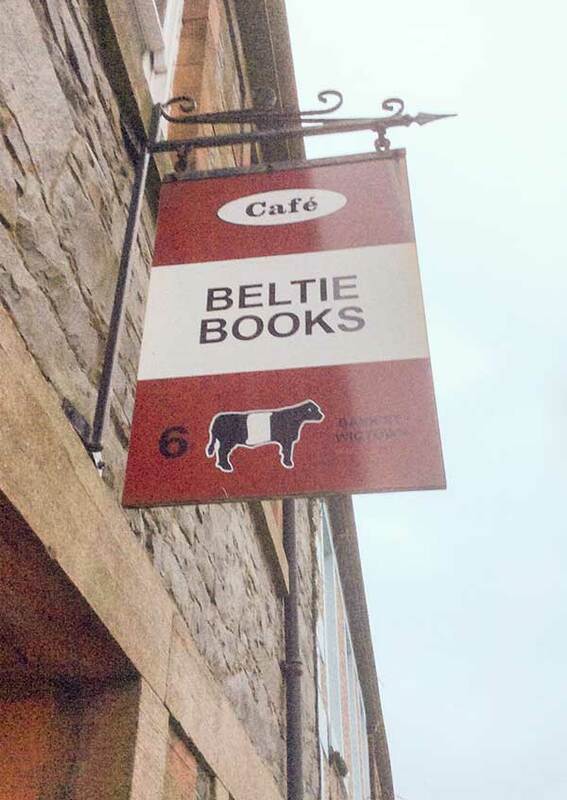 Fourteen independent bookshops in one tiny town? Surely … surely they can’t all survive buried in a remote location deep in a large rural county, way off the beaten track … can they? 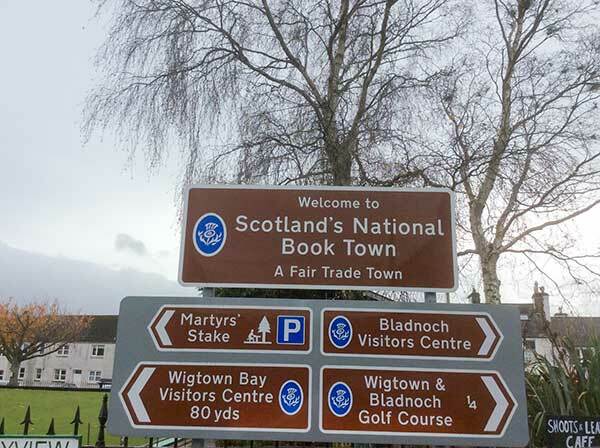 You haven’t been to Scotland’s National Book Town, Wigtown, in Dumfries and Galloway, then! From their names to their ambience, their range of genres to their quirky extras, they’re all distinctive, all appealing. 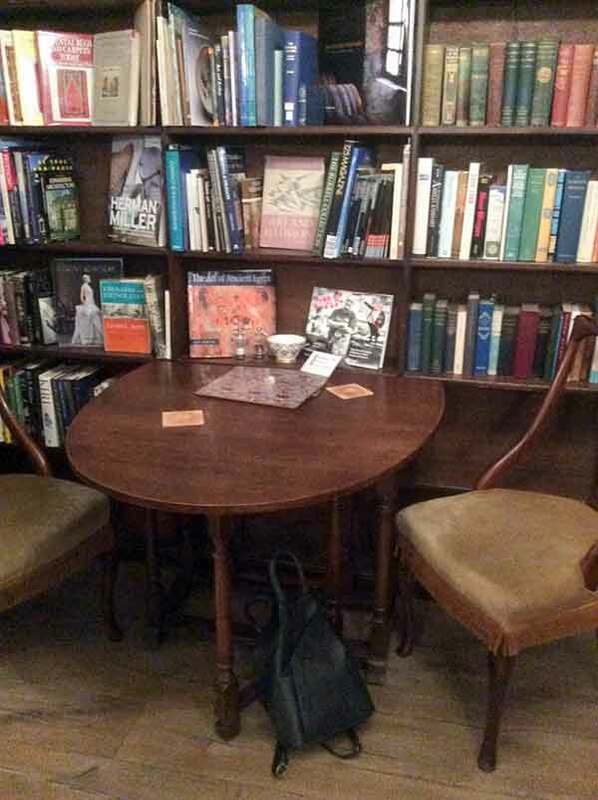 Pop in to the rustic cafe: ReadingLasses, and you get a sense of how special and distinctive this place is. Tables are scattered throughout the rooms; you bag a seat, and while you wait for your soup to arrive, you browse the books, take in the extensive ceiling-height display of old family photos and artefacts belonging to owner, Dr Jackie, (she was a scientist amongst other things in a former life), slip in to the Women’s Room devoted to lesbian literature and women writers … By the time I’d finished lunch I had five books ready to purchase. It’s irresistible. 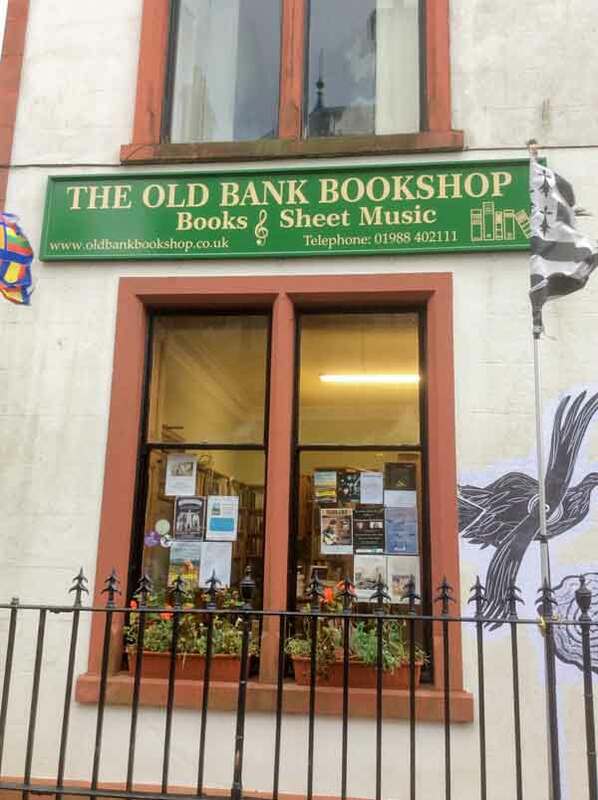 Excellent signposting, alphabetic sorting, isn’t confined to the Old Bank Bookshop where co-proprietor, Joyce Cochrane, is a qualified librarian; it seems to be a specialty of the town – so much easier to browse effectively compared with the more haphazard displays I’m used to in the city. 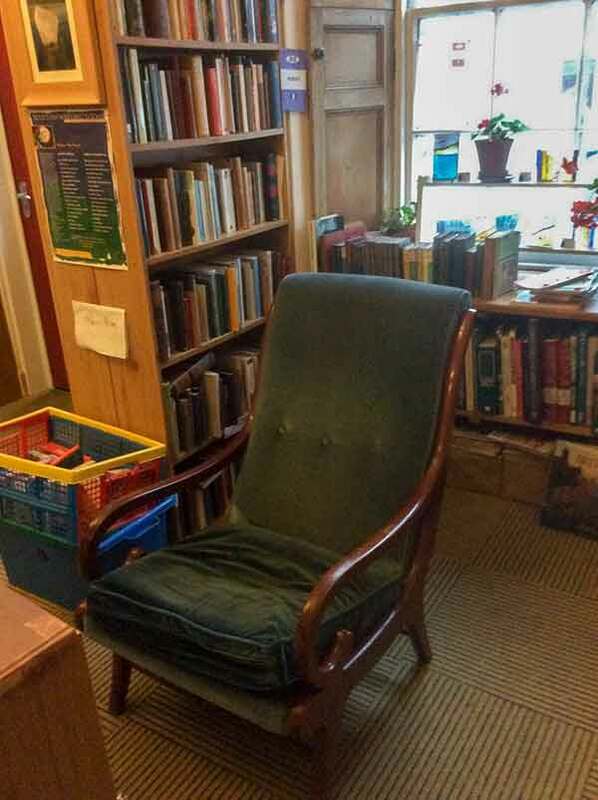 Most of the bookshops are divided into several rooms, inviting you to roam in peace, lingering to flick through possible purchases on the ubiquitous sofas and chairs. Bliss. 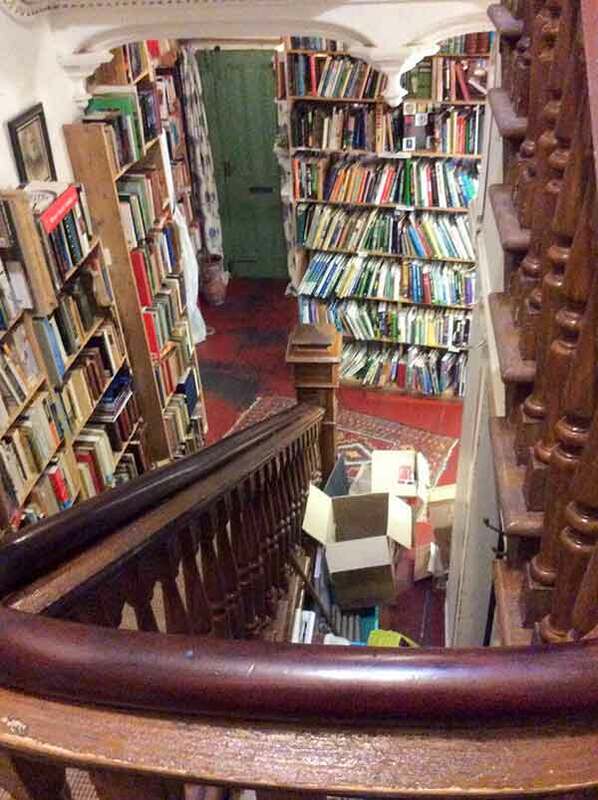 One shop (The Bookshop) even has a large bed filling a little mezzanine area!! Not surprising maybe as the owner, Shaun Bythell, is a rather eccentric chap with a whacky sense of humour which you see at every turn. 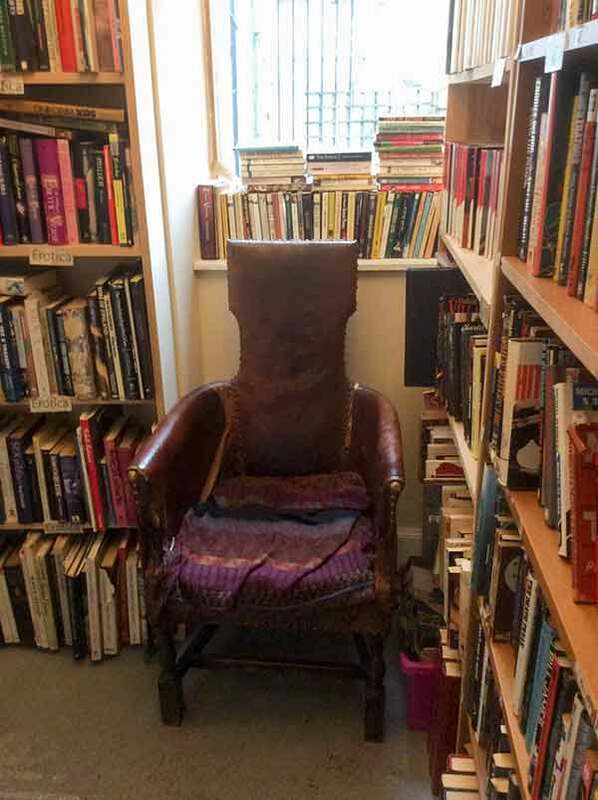 He is himself a published author as well as owning this the largest secondhand bookshop anywhere in the country, a Grade II-listed Georgian building, holding upwards of 10,000 books and a mile of shelving! Talk about ramshackle! … and no, I hadn’t caught him on moving-in day!! The place is littered with hazards and piles and boxes and assorted paraphernalia, (I think Shaun would probably give Health and Safety a pretty good run for their money!) 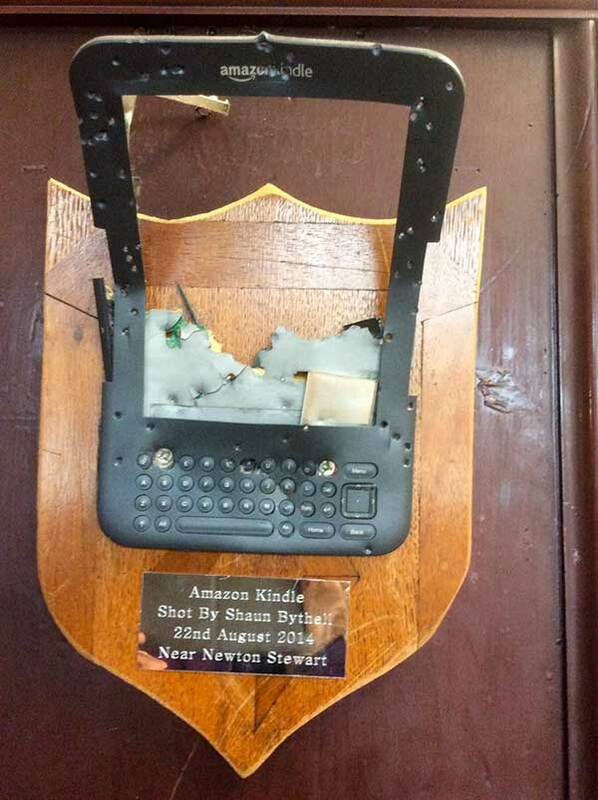 but it’s well worth the danger, if you escape without being vilified in his pithy diaries of a bookseller! But Wigtown is way, way more than a list of assets. 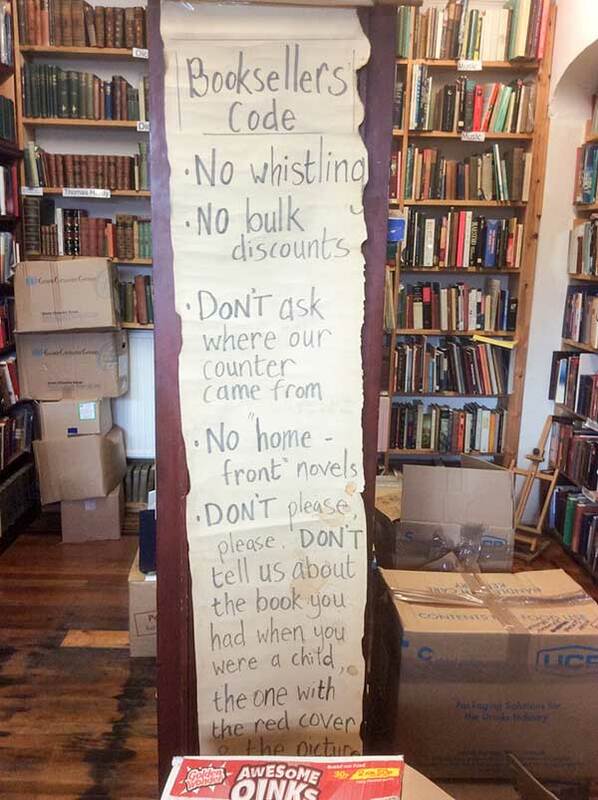 As you’ll have gathered, the owners of the said bookshops have fabulous pedigrees – including in their number not just the aforementioned scientist and librarian, but a sheriff/criminal QC, a social worker, teachers – lovely lovely people only too ready to share their stories as well as their welcoming premises. Maybe it’s true that it’s a universal dream …? It’s on that theory at least that they’ve based another project at The Open Book – billed as a ‘unique holiday experience’. 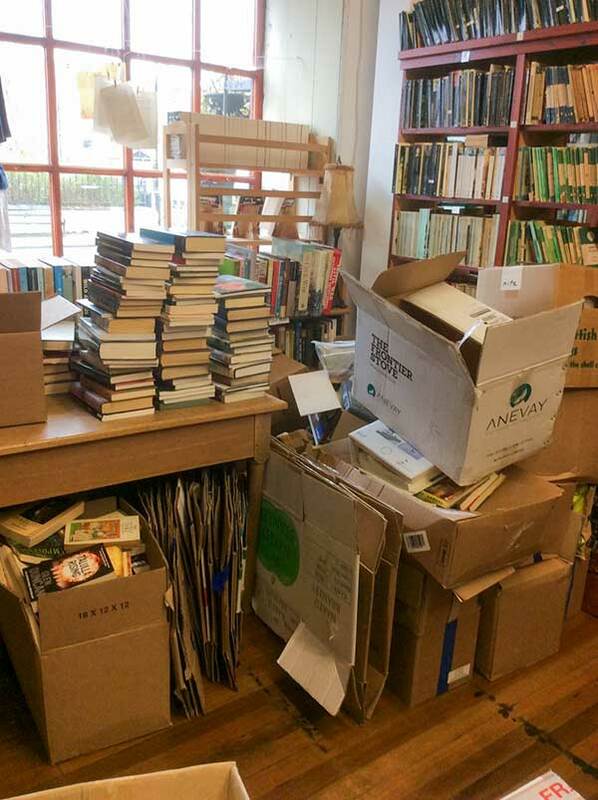 Members of the general public can come to run the bookshop for a couple of weeks, and they do indeed come, from around the world – it’s fully booked until 2021! 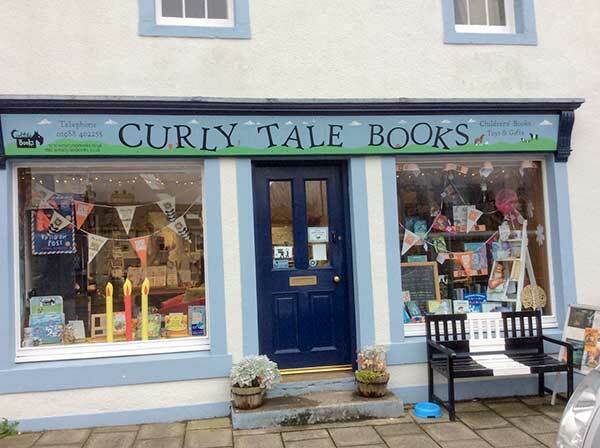 I have no idea how everyone copes with the competition behind the scenes, but there was a warm spirit of camaraderie in what they divulged to me, backed up by the enthusiastic team in the Wigtown Book Festival Office. 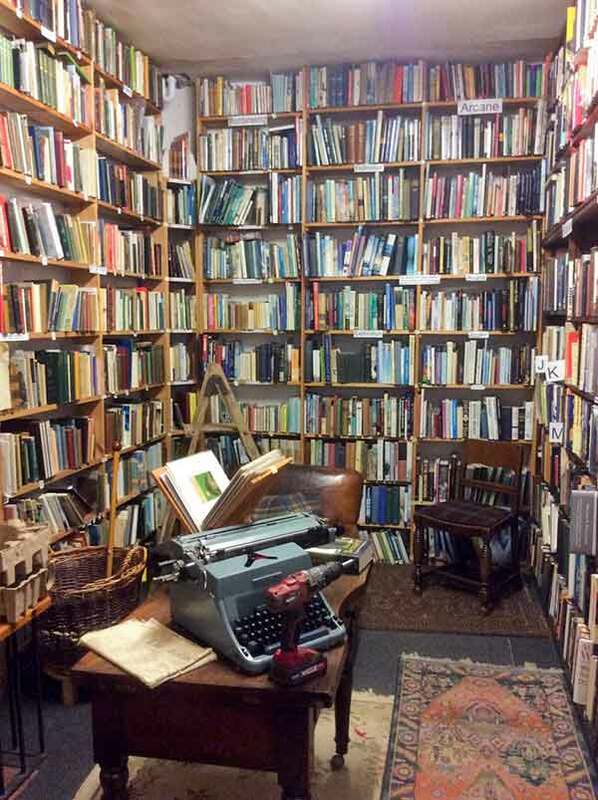 And there’s nothing ‘part-time retirement project’ about their ventures: these people know what’s on their shelves, they converse knowledgeably about authors, they’ve carefully retained a personal touch alongside the rustic country charm and history of their premises. 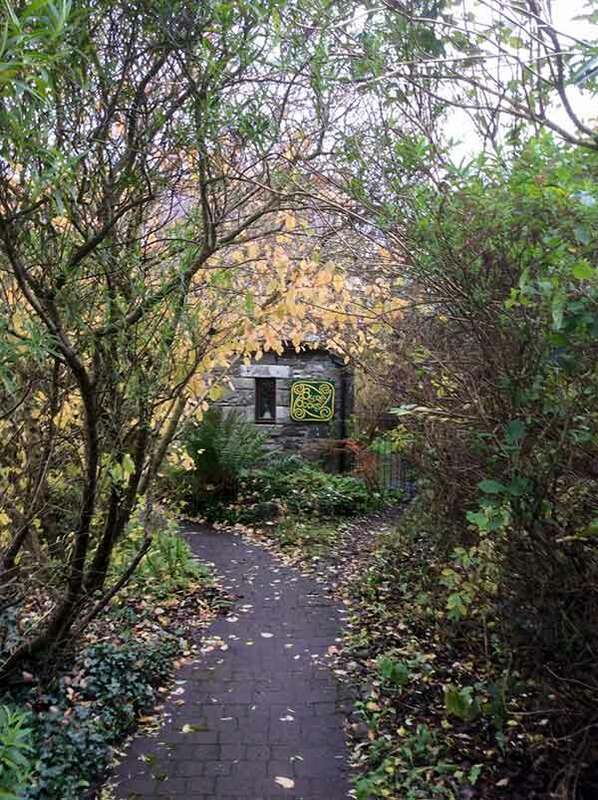 Sadly the Byre Books shop wasn’t open on weekdays in November, but it’s like a secret surprise hidden down a back alley at the end of a tunnel of trees; such a perfect location for books on folklore and mythology. 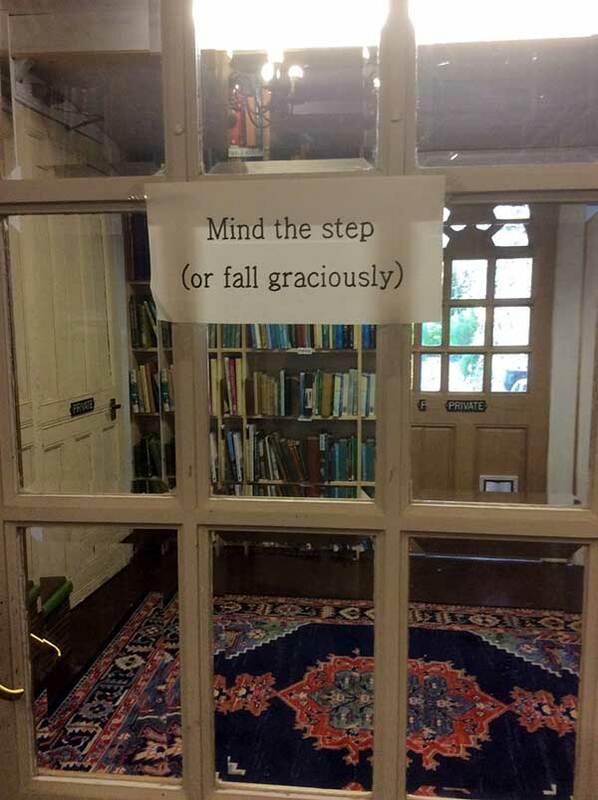 I crept down there twice just to savour the thrilling approach. 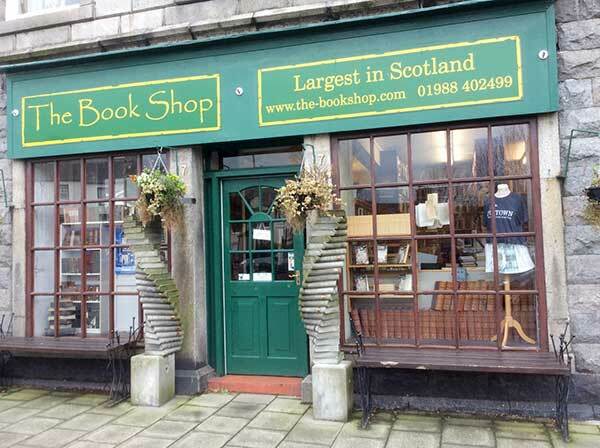 Friday morning was my leaving date, but I simply had to visit the newest bookshop: Well-Read Books, just opened (Friday to Monday only at the moment) by former criminal QC/sheriff, Ruth Anderson, so I popped down to the Wetlands to see the geese until she opened at 10. And boy, was it worth the delay. 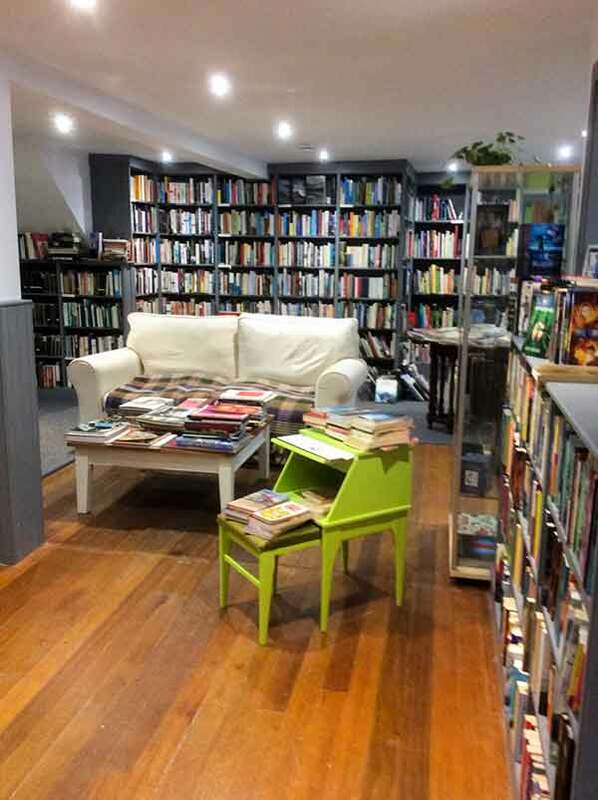 From the beautiful logo drawn by a local artist to the muted decor, it’s tastefully decorated (still smelling of paint it’s that new) and so beautifully organised, books in such good condition, it’s like a showcase. But this charming lady knows her subjects – many! It’s her ambition to source specific titles for customers and she totally made my day week year by producing not one but two Mary Elizabeth Braddons for me without advance warning. Rare treasures, so, of course, I had to snap up both. 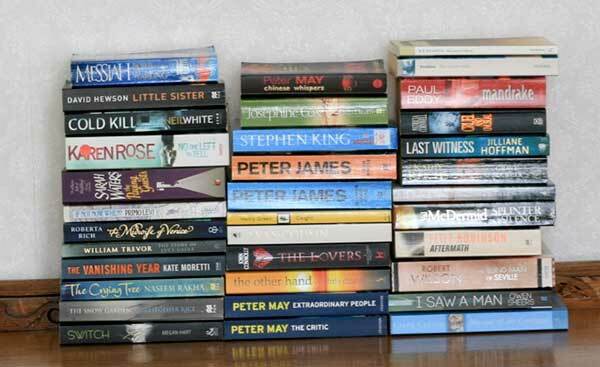 Time and space don’t allow me to detail more and retain your goodwill, but every bookshop was an experience, and I supported their ventures by purchasing no fewer than 35 books – only two of which were on my list! 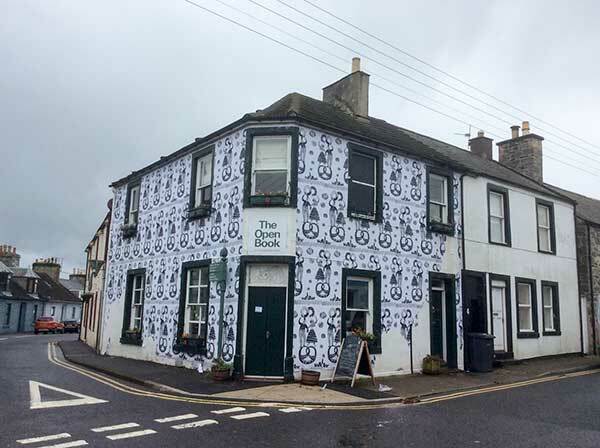 Thank you, Wigtown, for a fabulous experience. My brain is throbbing with the intensity of creating characters and connecting plot lines for my current novel, so it’s doubly important to build in relaxation to maintain sanity and have the space to engage with real life. 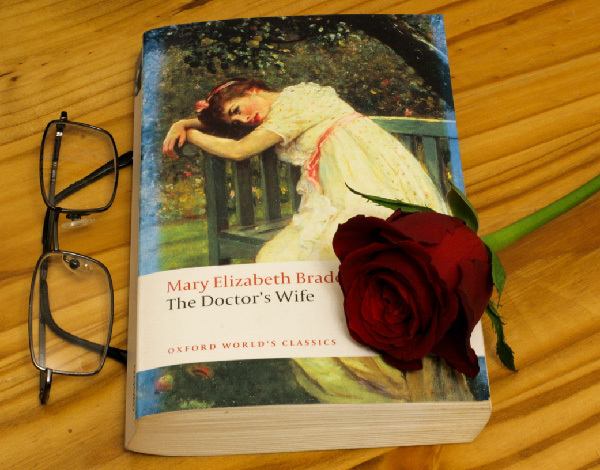 A lady called Mary Elizabeth Braddon has helped me wind down this week. Heard of her? Nor me till now – to my great shame. And that in spite of numerous TV, radio and stage adaptations of her work apparently! 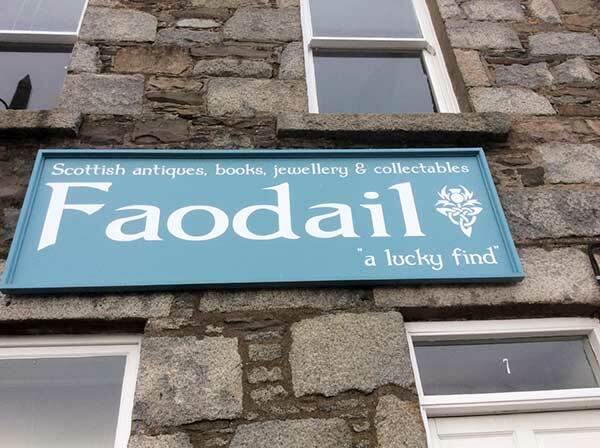 Because Ms Braddon (1835-1915) published over ninety books and became a household name in the Victorian era, hugely admired and respected by other famous authors like Wilkie Collins, Henry James, Charles Dickens, William Makepeace Thackeray. And this particular book, Lady Audley’s Secret, written when she was just 27 and a struggling actress, was the one that made her famous. It was serialised in the early 1860s at the same time as Dickens’ Great Expectations. Braddon quickly became the ‘Queen of the Sensational novel’, and to this day this book remains a classic Victorian spine-tingler. And there it was, amongst my own collection of not-yet-read classics! A hidden gem, but so good that I instantly want to buy all her other writings! Miss Lucy Grantham is a newcomer to the parish of Audley. She may be an impoverished governess, but she is also kind and ineffably beautiful. When Sir Michael Audley sets eyes upon her he finds himself in the grip of ‘the terrible fever called love’. Their courtship raises eyebrows, but Sir Audley has set his heart on the sweet-natured girl, and before long they are married. So, a light-hearted Georgette Heyer romance, huh? No such thing. This is something much deeper and darker – shades of The Suspicions of Mr Whicher, maybe? It’s a cleverly constructed mystery set in a grand country house and involving strange disappearances and duplicity on a grand scale. It’s Sir Michael’s nephew, Robert, who begins to suspect his new aunt is not all she seems to be, and his investigations lead him into a past full of inconsistencies, and very troubling secrets indeed, bigamy, blackmail, arson and murder among them. But the appeal of Lady Audley’s Secret has far outlasted the Victorian craze for melodramas, and goes beyond feminist politics. Why? 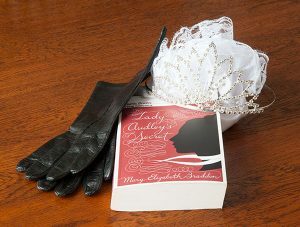 Well, Professor Robert Giddings believes ‘the continuing fascination might be in the character of Lady Audley herself. Such a crafty, villainous woman is not portrayed in the traditions of the villainess, but as an irresistibly attractive, innocent-seeming Pre-Raphaelite beauty.‘ Her charm, her feathery mass of golden ringlets, her delicate features and her strange deep blue eyes, predispose us to like her; but the portrait Robert and his friend George Talboys see of her reveals the ‘beautiful fiend’ within. The language is a little OTT and repetitious at times, the speeches run into several pages in places (including one by a dying man! ), and I do dislike the frequent references in direct speech to what the characters thought, but for all that it’s a riveting read. I galloped through the almost 500 pages effortlessly and will definitely seek out more of this amazing writer’s work. And it’s all there – the richly interesting characters; the careful backstories; the perfectly calibrated shocks; the interwoven connections – all the things I’ve been working at with my own writing. Seemingly effortlessly woven together. What a find!